Collaboration between the University of Southampton and the University of Cambridge has made ground-breaking advances in our understanding of the changes that materials undergo when rapidly heated. 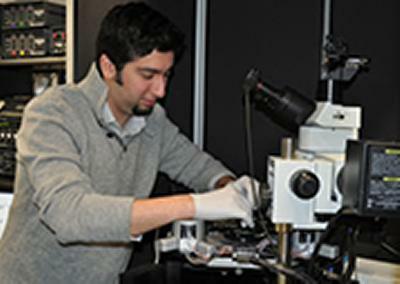 Using cutting edge equipment and specially designed MEM’s sensors on loan from Mettler-Toledo, scientists from the University of Southampton’s Optoelectronic Research Centre and the University of Cambridge’s Department of Materials Science were able to probe the behaviour of phase change memory materials, the semiconductors that store information in the next generation of electronics, as they were heated at rates up to 10,000 degree C per second. Insight and a detailed understanding of measurement results was provided by Professor Lindsay Greer, from the University of Cambridge’s Department of Materials Science, whose analysis showed that crystal growth rates differed considerably from other materials such as glass and silicon and the behaviour of these materials on such rapid heating was not as expected. The results, which are published this week in Nature Materials, show that crystal growth rates are much faster than we previously believed in these materials and that the growth behaviour is independent of the surroundings. While it is not surprising that properties of materials change significantly when they are shrunk to nanoscale dimensions, we now have a method of directly screening materials for improved memory performance; this means faster, smaller and less power hungry smart phones, ipods and computers are one step closer.